If you’re not leveraging your favorite airline’s online shopping portal, you are leaving miles—and possibly points—on the table. 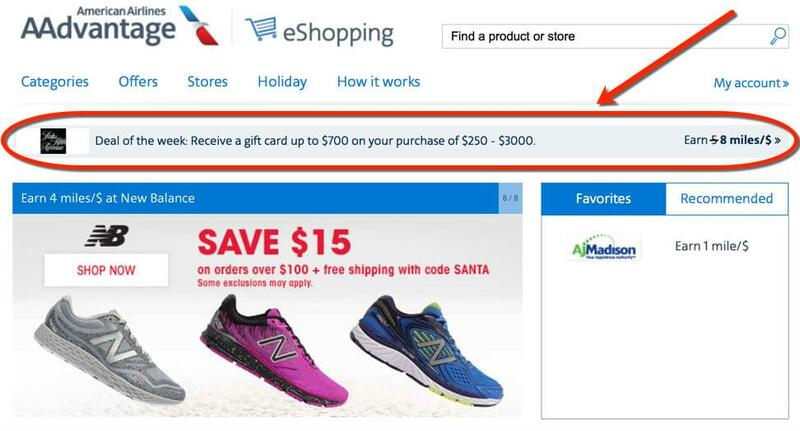 Sure, it might be easy to log in to your favorite etailer to buy that pair of sneakers for your kids, but if you go the extra mile and make one additional click at the airline portal, you’ll be rewarded with a certain number of miles per dollar spent—and that’s on top of whatever bonus your credit card offers you for making purchases. Let us help you discover the value of online shopping portals. 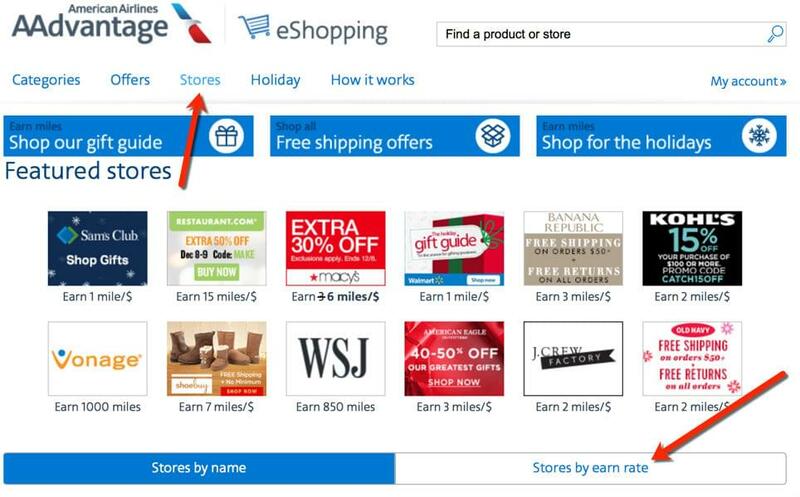 Today we’ll step you through American Airlines’ AAdvantage eShopping portal just in time for holiday shopping. Like most airline frequent flyer and hotel loyalty programs, American Airlines offers an online shopping portal. The portal makes it quick and easy for you to earn valuable AAdvantage miles, which can be used to book award flights on American Airlines flights as well as on every single oneworld partner airline. You can earn miles whenever you purchase something online from one of the shops that belong to the AAdvantage eShopping online mall. 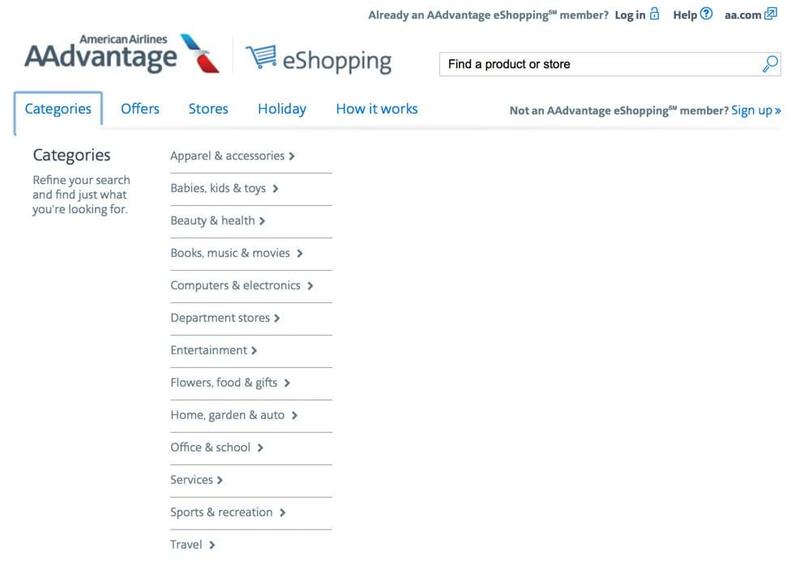 What Kind of Retailers Are Part of AAdvantage eShopping? Some of AAdvantage’s most popular retail partners include Macy’s, Neiman Marcus, Sephora, Walmart, Target, Best Buy, Kohl’s, The Home Depot, Nike, and JCPenney. Online shopping advances include some hidden gems in the category list, so you really need to explore the offerings. Otherwise, you may miss out on potential miles-earning opportunities. For example, under the Books category, you’d expect to find the popular chain Barnes & Noble. But, you’ll also find indie bookstore AbeBooks as well as The Scholastic Store for youngsters and Textbooks.com for college students. 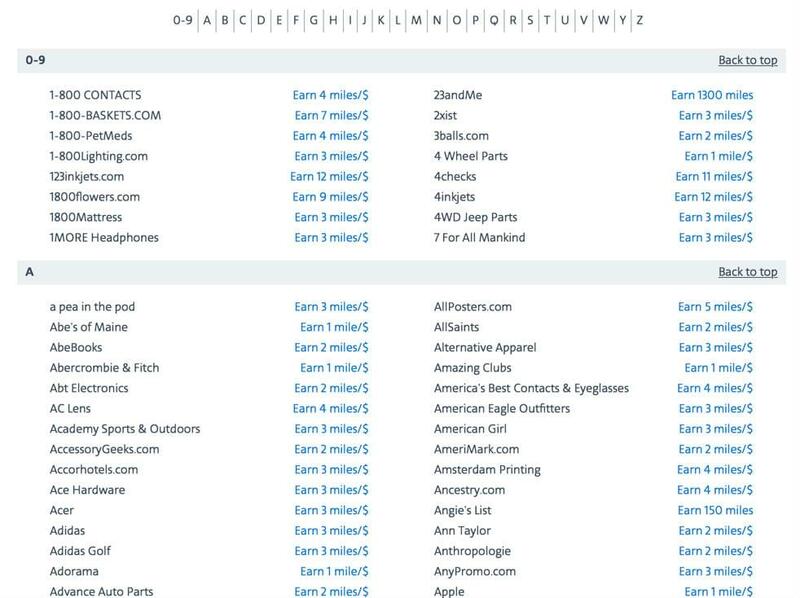 Hundreds of online retailers participate in the AAdvantage eShopping mall, so you’ll want to check out the directory to see if the stores you love are available. 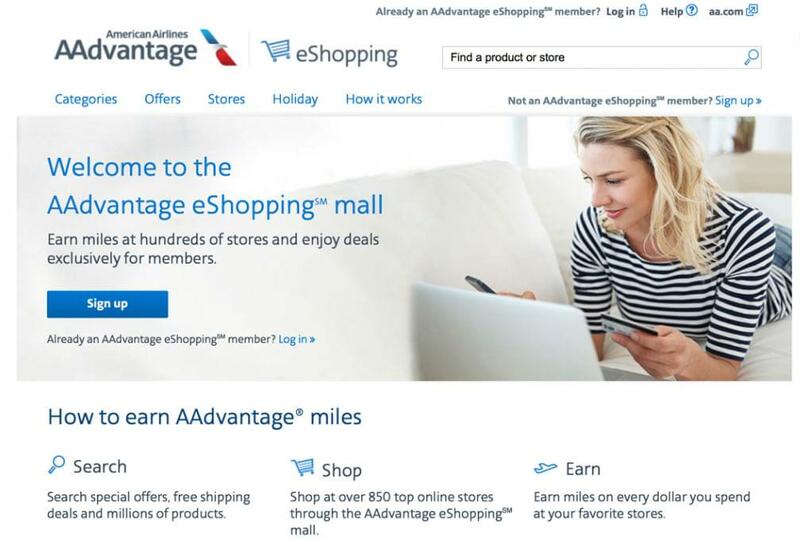 You will love how quickly you rack up the miles once you begin shopping through the AAdvantage eShopping mall. It’s really simple to get started. Sign up to be an AAdvantage eShopping member. In order to keep abreast of the mall’s special offers and deals, be sure to check the box at the bottom of the order form that adds you to the portal’s email list. Log in to the AAdvantage eShopping online shopping mall. The login link is at the top of the home page. Search the store you want to make a purchase from. Let’s say you want to buy something at Sephora. You’ll see a few offers from the store and a “Shop now” button. Click on the link that will take you from the portal to the store’s website. You must be logged in to your account when you click the link. Otherwise, your purchase won’t earn any points. When you log in to your account, look at the horizontal gray banner bar near the top of the page. It will tell you about any special “deals of the week.” The deal usually means an increase in the number of miles you’ll receive per dollar spent at that retailer. Click on the “Offers” tab at the top of the page, and you’ll get a menu that lists all of the current offers from every retailer that comprises the shopping portal. You’ll see deals for free shipping, gift cards, special holiday offers, and more. Let’s take a look at the Macy’s offer that’s promoted at the bottom of the list. Oh, this could be a boon for anyone that’s planning to spend at least $250 at Macy’s. 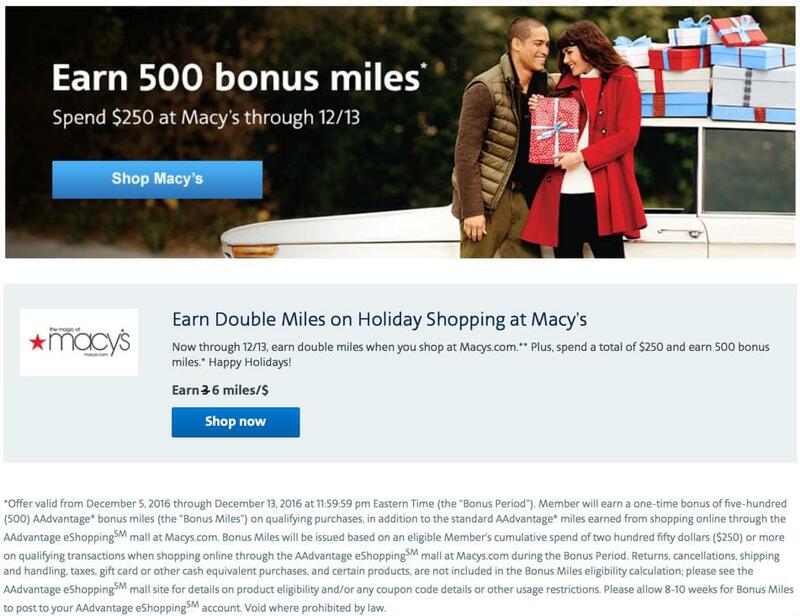 You’ll earn an increased number of miles per dollar spent: 6 miles per dollar instead of the normal 3 AND you’ll receive 500 bonus miles if you spend a minimum of $250 at the store. If you’re shopping during any holiday season, be sure to check the home page for a link called “Holiday.” It will lead you to all of the special deals that vendors are offering during a specific—and limited—time period. RewardExpert is publishing this story during the December holiday season so there are a number of deals to consider. Be sure to sort the list by the highest earn rates; click on the tab that says “6+.” The miles per dollar payout changes randomly so it’s always a good idea to review the list before you decide to purchase through the portal. Whenever you shop online you’re faced with the decision of what credit card to use. When you buy anything through the AAdvantage eShopping portal, you’ll most likely want to use your Citi / AAdvantage credit card that rewards you with AAdvantage miles for every dollar you spend. 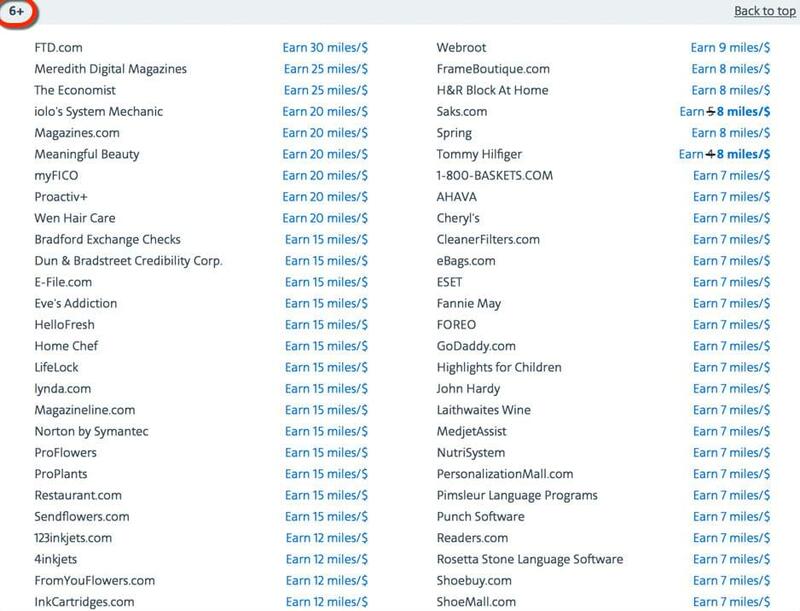 That’s in addition to the miles you’ll earn for shopping through the portal. Let’s look at an example. 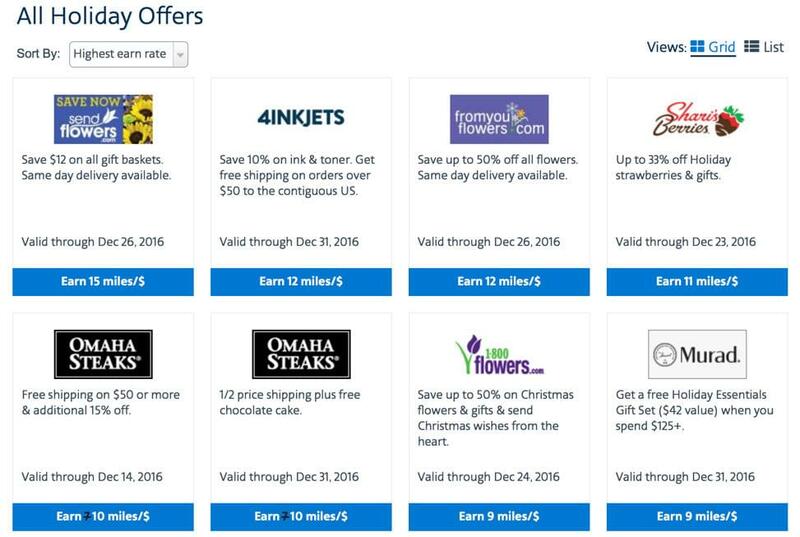 If you send flowers from FTD by clicking on the link at the AAdvantage eShopping portal, you’ll receive 30 miles per dollar spent. So, if your total before tax and delivery was $89, you’ll be rewarded with 2,670 AAdvantage miles from the portal. Now, when you charge this purchase to your credit card you’ll earn more miles or points. If you use the Citi / AAdvantage Platinum Select Card, you’ll receive 1 mile for every dollar spent on your purchase. The flowers were $89 but with tax and delivery your total was $104.95. Citi will reward you with 105 AAdvantage miles for that purchase. So, when all is said and done, you’ll receive 2,775 AAdvantage miles for your purchase (2,670 miles from the shopping portal and 105 miles from Citi for using its AA-branded credit card). 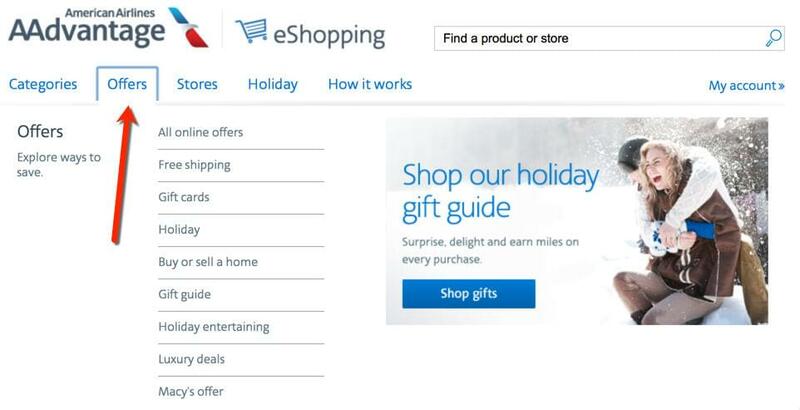 If you’re going to make purchases anyway, it’s a no-brainer to do so through the AAdvantage eShopping mall. You’ll earn a healthy number of miles each time you shop. An informed shopper is a smart shopper. Just because there is a “deal” at the AA shopping mall doesn’t mean it’s the best deal. You’ll need to determine if you’re best off making the purchase through the portal or elsewhere. Sometimes you’ll receive a money-off discount code from your favorite retailer. Oftentimes, those coupons can’t be used in conjunction with an online shopping portal that rewards you with miles or points. 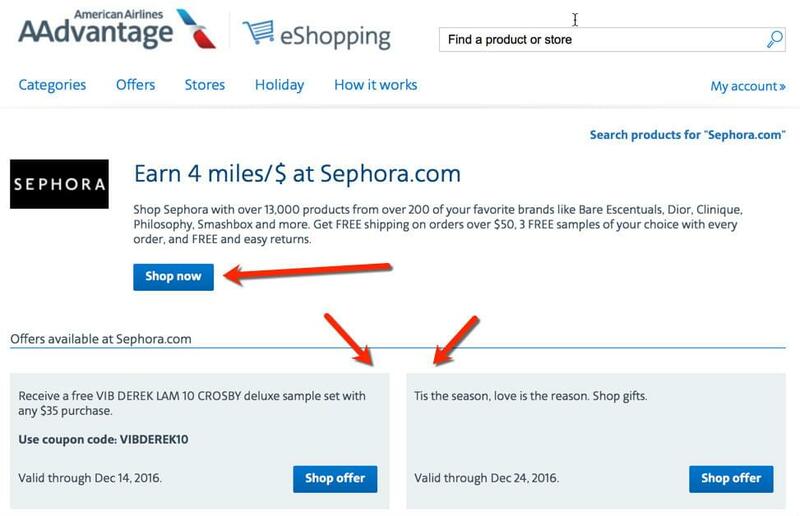 You’ll need to read the fine print for each shop to determine if you can use a coupon that was sent to you. Otherwise, look for coupons and deals right at the AAdvantage eShopping portal. You may find the same, or better, options. Most stores offer a certain number of AAdvantage miles for each dollar you spend. However, there are a few dozen retailers that offer a fixed number of miles for a specific purchase. For example, you can earn 25,000 AAdvantage miles for switching to Sprint through the portal. Or, you can earn 150 miles for buying a paid annual membership to Angie’s List. You’ll need to look at all of your other buying options outside of the shopping portal to see if it makes sense or not. Once you get the hang of how the AAdvantage eShopping mall works, you’ll be earning miles on all of your online purchases. To find the best use of all those AAdvantage miles, use RewardExpert, a free service that will help you figure out the best partner airline to use American’s currency on based on where you want to go.